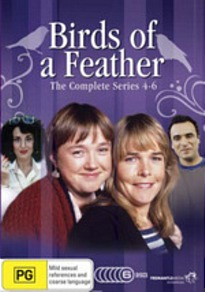 Birds of a Feather Season 4 - 6 DVD Review The real strength of this show is, as in many other British comedies, the writing. It is rich in wordplay and sexual innuendo. This sit-com was a British fixture of the 1990s, running for nine seasons from 1989. The middle bloc (seasons 4–6) would, in theory, be the most representative. After the first three seasons, the characters (and their actors) are established and the writing and directing is going smoothly. It is also before the last third (seasons 7–9), when the sense of an end starts to be felt. Having dated reasonably well, Birds of a Feather is about two sisters whose husbands are both incarcerated. Pauline Quirke is Sharon, the one from the poorer side of the tracks. She has moved in with Tracey (Linda Robson) on account of their husbands’ criminal consequences. The horny neighbour Dorien (Lesley Joseph) completes this feminine trinity. She is a very memorable side-kick, obsessed as much with sleeping with men as with denying it. She is also super-pretentious, wishing to keep those less socially mobile or wealthy out of posh Chigwell, whilst always seeking to climb higher herself. She is also insistent on reminding the two sisters of their relative inferiority. She is a melange of Hyacinth Bucket and her famous Keeping Up Appearances sisters. The real strength of this show is, as in many other British comedies, the writing. It is rich in wordplay and sexual innuendo. There are also many tense, awkward scenes. While I didn’t find myself laughing uncontrollably, the show is largely entertaining. It does feel kind of low budget, with the kitchen set getting a lot of workout. In one memorable episode, which is quite typical, it is rumoured that Princess Diana would be moving to the neighbourhood to avoid the paparazzi. Poignant anachronisms such as this are one rewarding aspect of rewatching these shows from when we were younger. I know I must have watched it without even registering half the ‘naughty’ jokes. The audio is Dolby 2.0 and they have tried to scrub up the vision and sound; but there’s no denying a pre-digital TV show when you know what to look for. This is a borderline recommendation from me, only because there is so much material. Those buying it should probably be familiar with what they’re in for or they will regret the 18 hours of viewing they’ll never get around to!